Naturalized in Australia, New Zealand, Ireland, the UK, and the U.S. (GRIN). This species currently has a limited naturalised distribution in south-eastern Australia (i.e. naturalised in central Victoria and south-eastern South Australia). In Victoria it is locally common near the towns of Creswick and Castlemaine, while in South Australia it is restricted to the Southern Lofty Mountains region (it has possibly been eradicated from this region). Also naturalised overseas in the UK, New Zealand and western USA (i.e. California, Oregon and Washington) (Weeds of Australia). Naturalized in Australia, New Zealand, Ireland, the UK, and the U.S. (GRIN). This species currently has a limited naturalised distribution in south-eastern Australia (i.e. naturalised in central Victoria and south-eastern South Australia). In Victoria it is locally common near the towns of Creswick and Castlemaine, while in South Australia it is restricted to the Southern Lofty Mountains region (it has possibly been eradicated from this region). Also naturalised overseas in the UK, New Zealand and western USA (i.e. California, Oregon and Washington) (Weeds of Australia). Naturalization in California and other regions with overlapping climate zones warrants a "yes" to this question (Cal-IPC). Has become a weed in agricultural land and an invasive species in natural habitats in Australia and North America. This plant is a serious noxious weed of agricultural fields and a colonizing invasive plant in wild lands in parts of Australia and California (EOL). 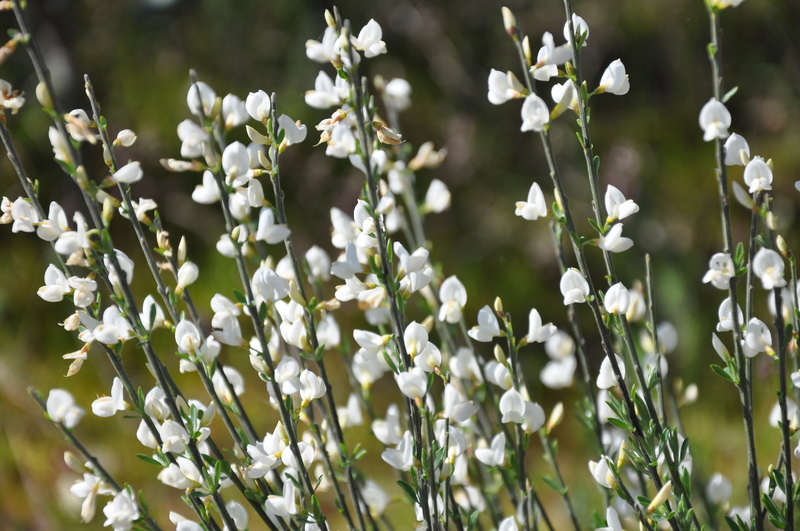 White Spanish broom (Cytisus multiflorus) is on the national Alert List for Environmental Weeds and is regarded as a serious environmental weed in Victoria (Weeds of Australia). Has become a weed in agricultural land and an invasive species in natural habitats in Australia and North America. This plant is a serious noxious weed of agricultural fields and a colonizing invasive plant in wild lands in parts of Australia and California (EOL). White Spanish broom (Cytisus multiflorus) is on the national Alert List for Environmental Weeds and is regarded as a serious environmental weed in Victoria (Weeds of Australia). Invasiveness in California and other regions with overlapping climate zones warrants a "yes" to this question (Cal-IPC). C. scoparius is an invasive plant in India (zones 5a-13b), the Canary Islands (zones 10a-12b), throughout much of Canada (zones 0a-6a), throughout much of the U.S. including California, Brazil (zones 10a-13b), Argentina (zones 5a-10b), Chile (zones 7a-11b), Romania (zones 5a-7b), and New Zealand (zones 8a-11b) (CABI). In Australia: Like its close relative Scotch broom (Cytisus scoparius subsp. scoparius), it could also become a major weed of forestry plantations (Weeds of Australia). All of these areas overlap with California's climate zones (zones 5-12+) (Cal-IPC). C. scoparius and C. striatus are listed as weeds in California (Invasive Species List and Scorecards for California). Genista (related) monspessulana is a weed in California (Cal-IPC PAF). Substantial climate zone overlap. California Invasive Species Advisory Committee, Information Center for the Environment, UC Davis (2010). Invasive Species List and Scorecards for California. Present in California, Oregon, Washington; very dense in Spain, the Mediterranean, and other parts of Europe; present in south-eastern Australia and New Zealand (GBIF). Native to Portugal; Spain (GRIN). Present in: Argentina (introduced); Australia (introduced); France (introduced); India (introduced); Italy (introduced); Madagascar (introduced); New Zealand(North) (introduced); New Zealand(South) (introduced); Portugal (native); Spain (native); United States (introduced) (ITIS). Native to Mediterranean region (EOL). Grows best in zones 8a-9b (Dave's Garden). C. multiflorus is thought to prefer warm dry conditions that occur in much of temperate Australia (Tasmanian Government Invasive Species). Most of these areas overlap substantially (particularly when taken collectively) with California's climate zones (Cal-IPC). Bisby, FA., Roskov YR., Orrell TM., Nicolson D., Paglinawan LE., Bailly N., et al. (2010). Species 2000 & ITIS Catalogue of Life: 2010 Annual Checklist. It is known to invade relatively undisturbed bushland and it is thought pose a threat to a wide range of disturbed and undisturbed native habitats, such as grasslands and open eucalypt woodlands. It can form a dense shrub layer that outcompetes native species, shades out native herbaceous groundcover plants and prevent the regeneration of eucalypt seedlings (Weeds of Australia). C. multiflorus is generally described as highly competitive because of its ability to colonise rapidly, fix nitrogen and because its growth habit allows it to form dense, impenetrable thickets that exclude other plants (Victorian Invasive Plants). The other, major, part of dispersed seeds is dormant, which permits the formation of a persistent soil seed bank (MORENO, 1992) creating in this way a seed dispersal mechanism in time (VENABLE & BROWN, 1988). These seeds will later, when stimulated, form part of the population. It will generally occur when there is drastic disturbance such as fire, soil turning over, etc (Primary dispersal of Cytisus multiflorus seeds). An exhaustive Google/Google Scholar search did not reveal any additional evidence regarding this and the question defaults to a “no” answer at this time. G. Marcos, M., Gutiérrez J.. M. Gómez, & B. Santos F. (1992). Primary dispersal of Cytisus multiflorus seeds. Pirineos. 140, 75–88. Seed is poisonous if ingested (Dave's Garden). A weed of roadsides, disturbed sites, urban bushland and open woodlands in temperate regions. Potentially also a weed of pastures, forestry plantations and grasslands (Weeds of Australia). Thickets of C. multiflorus may harbour pest animals and restrict access to water. Seeds are poisonous (Victorian Invasive Plants). This receives a "no" however, because an exhaustive Google/Google Scholar search did not reveal any additional compelling evidence of reductions in carrying capacity or instances of common poisoning, and the question defaults to a “no” answer at this time. Cytisus multiflorus is a shrub growing up to 3 metres (9.8 ft) or 4 metres (13 ft) in sprawling height (EOL). White Spanish broom (Cytisus multiflorus) may form thickets in pastures, preventing grazing and restricting access to water. It also provides shelter for feral animals and its seeds are poisonous (Weeds of Australia). C. multiflorus is generally described as highly competitive because of its ability to colonise rapidly, fix nitrogen and because its growth habit allows it to form dense, impenetrable thickets that exclude other plants. The habit of the plant means uncontrolled infestations may form a barrier to stock, vehicular and people movement, especially along riparian areas (Victorian Invasive Plants). Generally reproduces by seed, but infestations may also spread locally through stem pieces taking root (Weeds of Australia). In Australia, flowering occurs mostly during spring and early summer (i.e. from September to December) and is usually very prolific and relatively short-lived (Weeds of Australia). C. multiflorus flowers prolifically in spring but only a small proportion of flowers set fruit. Pods ripen over summer and seeds are released as pods dry out (Tasmanian Government Invasive Species). One study found seed production varied from 3841-89,430 seeds per plant. However, that study also found that only 37% of seeds reached maturity, with the remaining either aborted, eaten, or not fully developing. However, even in this case, over 1000 viable seeds would still be produced per plant (Primary dispersal of Cytisus multiflorus seeds). Seed ripens in summer and seeds germinate with autumn rains (Tasmanian Government Invasive Species). However, one study found that of the total number of tested seeds 1.2% did not show germinating capacity (they were not viable); 2.13% germinated readily without any stimulation (they were non-dormant); and the rest germinated only after mechanical scarification (they were dormant). This gives us a 98.8% viability index and 98.9% that of dormancy; thus placing C. multiflorus among those species with the highest dormancy index. These seeds form a soil seed bank which creates a dispersal mechanism in time. In the present study we found that 2.13% of seeds were non-dormant. But this figure could very significantly depending on the surrounding conditions (drought/dryness) under which seed maturity was reached. AÑORBE (1988) reports 12.08%, although in his study seeds were collected directly from the plants, possibly not having fully matured yet (Primary dispersal of Cytisus multiflorus seeds). They do not usually set seed until they are at least three years old (Tasmanian Government Invasive Species). Blooms March - April (Calflora; Jepson). In Australia, flowering occurs mostly during spring and early summer (i.e. from September to December) and is usually very prolific and relatively short-lived (Weeds of Australia). C. multiflorus flowers prolifically in spring but only a small proportion of flowers set fruit. Pods ripen over summer and seeds are released as pods dry out (Tasmanian Government Invasive Species). The pods turn black with age and dehisce explosively to release their four to six seeds away from the parent plant (EOL). The fruit are slightly elongated (i.e. linear-oblong) pods and are covered with short hairs (i.e. they are finely pubescent). These pods (15-30 mm long and 4-7 mm wide) turn from green to black as they mature and release their seeds explosively when fully ripe. Each of the pods contains 3-7 seeds (2.5-3.0 mm long) that are olive to brown in colour. Generally reproduces by seed, but infestations may also spread locally through stem pieces taking root. Most of the explosively released seeds fall within 1 m of the parent plant. However, they may be spread over longer distances by water or in mud attached to vehicles, machinery, footwear and animals. Seeds and stem pieces may also be dispersed in dumped garden waste (Weeds of Australia). Dispersal occurs when seed is dehisced within a metre radius of the parent but seeds may also be moved in contaminated soil, vehicles, animals and by water. Human assisted dispersal occurs via the ornamental plant trade and garden waste dumping (Tasmanian Government Invasive Species). Dispersion is assisted by an explosive dehiscence of the seed pod in that only 35% of the seed drop directly beneath the plant, the remainder falling further away, some reaching distances greater than 3 m. Nevertheless, it is a simple seed dispersal mechanism which doesn't facilitate the seeds reaching long distances —about 4 m is the maximum— and leaves a large number of seeds (35%) right below the plant. But with the great advantage that it does not require any additional effort from the plant for their dispersal (Primary dispersal of Cytisus multiflorus seeds). The primary mechanism for dispersal seems to be explosive dehiscence away from the parent plant, but this does not confer long-distance dispersal. No morphological adaptations exist for dispersal via these mechanisms. Generally reproduces by seed, but infestations may also spread locally through stem pieces taking root. Most of the explosively released seeds fall within 1 m of the parent plant. However, they may be spread over longer distances by water or in mud attached to vehicles, machinery, footwear and animals. Seeds and stem pieces may also be dispersed in dumped garden waste (Weeds of Australia). Dispersion is assisted by an explosive dehiscence of the seed pod in that only 35% of the seed drop directly beneath the plant, the remainder falling further away, some reaching distances greater than 3 m. Nevertheless, it is a simple seed dispersal mechanism which doesn't facilitate the seeds reaching long distances —about 4 m is the maximum— and leaves a large number of seeds (35%) right below the plant. But with the great advantage that it does not require any additional effort from the plant for their dispersal (Primary dispersal of Cytisus multiflorus seeds). The primary mechanism for dispersal seems to be explosive dehiscence away from the parent plant, but this does not confer long-distance dispersal.